Today we have a twist on lasagna! We are not using any pasta and are using our hydroponic eggplant instead. Some people are reluctant about eggplants because they are somewhat bitter. Nevertheless, we have the solution for it: salt. Before you begin preparing your recipe, you should follow a few simple steps for removing its bitterness. That is, you cut the eggplant in the form requested in the recipe, place the pieces in a strainer, sprinkle with a generous amount of salt and leave to rest for at least half an hour. Make sure you put a container underneath to collect the liquids. Remove the salt by washing it off with cold water, and you are set! Now, back to the recipe. The combination of the vegetables with sauce and cheese is very tasty. It is fairly easy to make, and we grant that it may take a while to prepare (so make sure you are not terribly hungry at that time), but it sure will be worth it! Roast vegetables – Preheat oven to 180° C. Prepare the eggplants as suggested above to remove the bitterness. Cut the bell peppers into strips. Place each in separate baking sheets, drizzle with olive oil and dried oregano. Bake until softened and golden. Prepare the sauce – While the vegetables are in the oven, heat 1 tbsp olive oil in a saucepan, add chopped onion and minced garlic cloves until onion is crystalized and garlic becomes lightly golden. Pour the pasta sauce, when it comes to a boil, reduce the heat and simmer for a couple of minutes; remove from heat. Assemble the lasagna – Lightly grease a deep ovenproof dish. Spread 1 tbsp of the pasta sauce (thin layer) to avoid the bottom layer to stick to the dish, place a layer of eggplant slices. Scoop about a third of the ricotta cheese. Ladle a third of the pasta sauce. Place half the peppers and half of the chopped basil leaves. Repeat the process. Finish with sauce and sprinkle with the shredded mozzarella cheese. Pop back in the oven and bake until mozzarella has melted and lasagna has cooked through; about 30min. Serve. Source: Adapted from Country Living. 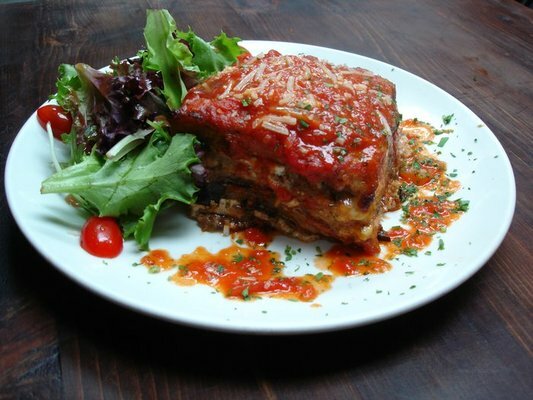 Categories: Eggplant, Recipes | Tags: lasagna, low fat ricotta cheese, main course, roast vegetables, vegetarian | Permalink.